With launch of regular pack size of Rs 10/- and Rs 20/- in Indian brnaded biscuit market Cadbury Oreo is now available in low price tag of Rs 5/- for 29.4 g ( 3 cream sandwiched biscuits ) . 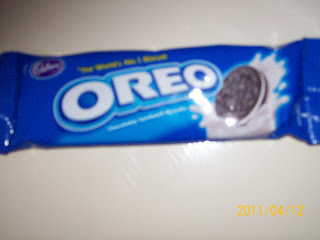 Oreo has now joined local players such as Britannia , Parle and ITC competing for volumes over premium ( low price tags ). Consumers who prefers on the move snacks such as school going kids or youngster planning evening hangouts or the budget conscious consumers could be the target for such pricing . Cadbury Oreo has launched its Rs5/- pack biscuits in a Pile pack arrangement instead of more popular format of On the Edge biscuit pack this arrangement gives a feeling of more biscuit in a pack .Packaging is done with metallised laminate. Only difference we can figure it out between imported Oreo and now available local Oreo is the strength of shell which cracks up with little pressure while opening the pack . It could be due to flour or baking features done for local Oreo .